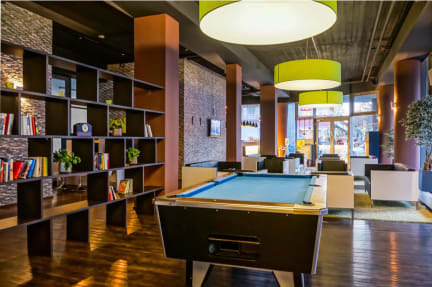 Smart Stay Hostel was my first experience to stay in a hotels and thank you to Smart Stay as they gave me an awesome experience. I plan to make it my home if i ever return to Berlin. The beds are very comfortable and the room bathroom are spotless clean. The staff are very welcoming and helpful in every situation. As I adjusted to this new environment, they made my stay comfortable. The quiet times in the lobby and good wifi speed made it easier for me to continue working. Good stay. Nice beds. No lockers. Great staff. Good starting point when you travel from ZOB bus station. Friendly internationally minded staff. With a U-Bahn Tageskarte, there are no distances in Berlin, so any location is good at the end. In the evening, before going to the bus station, give your metro day card to someone who can use it to travel to the night shelter, to sleep somewhere off the street. Good place to meet people, like most places in Berlin. The hostel itself is not located in the downtown. However, it's compensated by great accessibility to public transport - literally 5 minutes to U-Bahn station Bismarckstraße and half an hour to main tourist attractions. 2 U-Bahn station away from ZOB, the mail couch station. You can even get there on foot - it's a 30-minute walk. Luggage storage available before check-in and after check-out. Supermarket Penny right across from the street. No guest kitchen and wifi can get shaky at times. 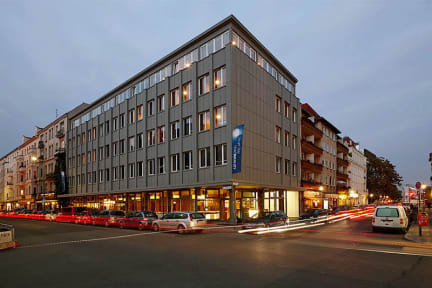 The hostel is in the shopping street of Charlottenburg, near the metro station Bismarckstr. Good connection to Tegel airport. Charlottenburg sights (castle/park) nearby. Dorms without private space, but with WC/shower. Nice bar/social area. Pricing flexible to demand - in my case good value for money. Can’t charge my phone on the bed. It’s a problem for me! For one night it was okay and value for the price. The bed was comfortable in a 6 bed dorm, but I missed a locker and the bathroom looked a bit dirty. My experience in this hostel was a bit out of sense, the location was quite good and easily you can walk a few meters to get to transportation, and there punch of resto, cafe, and supermarkets. but regards the hostel itself. When I finished my registration and check-in process, the receptionist did not give me a name tag, which is a big problem in this case because the next day evening I found someone sleeping in my bed, because there was no name tag and that guy unluckily picked my bed to sleep. I had booked for two people , unfortunately we were late ,we were not present . We hadn't used a room as well , instead of refund 23 euros has been debited more . I mailed hostel world with regards to this but i didn't got any revert .